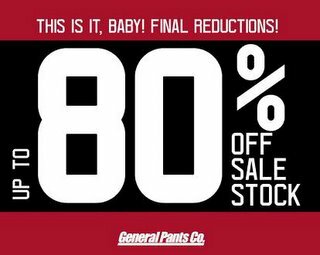 Chic Alert: General Pants 80% Off Sale! The biggest deals of the season are on now at General Pants. Heaps of killer gear has been reduced further and piles of fresh styles have been added to our end of season deals. Get into General Pants and treat yourself to all the cool stuff you deserved for Valentines Day but that slack special someone didn’t get for you. At least GP will treat you right!! Check out select guys and girls tops from $20 and select guys and girls bottoms from $30. Happy belated Valentines to you! For a limited time only, while stocks last and not available at all locations. At the last GP sale I bought a pair of dark denim supatubes for around $90...if they're at or below that again I'll be tempted to get another pair. I also bought a hot pink shirt by Insight from memory down from about $80 to $20 and it's gorgeous. Hoping they've also got Adidas jackets as I missed this on their sale a while back.